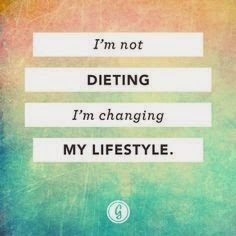 So many people in my hometown have been on a diet craze or a lifestyle" change with a certain program. I'll admit I'm a member of the program too but haven't been a loyal follower. Does this sound familiar in our walk with God too? I belong to Him but I'm not a faithful follower? Overweight is bad for the body. Overweight or weighted down with burden and care are also bad for the soul. Excessive fat and sugar are bad for our bodies. They cause diabetes, weight gain, heart disease and high blood pressure. Eating unhealthy, sinful, spiritual food causes strife, envy, discord and separation from God. Eating bad food for the body adds weight and manifests in your appearance. Do you get pimples when you eat chocolate or dark circles under your eyes when you drink cola? Same thing happens to our spirit when we continue to sin. Smiles turn into frowns, politeness turns to rudeness and your spirit dries up or dehydrates from the lack of Living Water. Body mass index (BMI) measures height and weight to calculate an optimum state for our body. I think someone should create an SMI or soul mass index which measures how our spirits measure up. We could use Galatians 5:22-23 as our measuring stick. 22But the fruit of the Spirit is love, joy, peace, longsuffering, gentleness, goodness, faith, 23Meekness, temperance: against such there is no law. We can’t look in the mirror and see our health statistics. A doctor has to measure our blood pressure, glucose, iron levels, cholesterol and so on. But I'll guarantee a bad SMI is written all over our faces. People can see if Christ is living in us by our fruits. Do you display love, joy and peace? Do you offer longsuffering, gentleness and goodness? We know when we should visit a doctor. Why do we put it off? We put it off doing because it will cost us something. It’s the same way with our Christian lives, it costs us some discomfort to live for Christ. It’s easier to say yes and eat the poison! Doesn't It feel good to step on the scale and be rewarded for a job well done. "You lost 3 lbs" is sweet to the ear and encouraging to the organs. Your heart smiles, your liver says whew and your kidneys thank you for keeping them wet! All of a sudden, we are glad we didn't eat the Oreos or the ice cream. God pats us on the back too when we follow him and his ways. I love it when I get blessed by God. It’s better than weight loss! Remember this: Christianity is not a diet! It is not something that is just followed when you need to see results. Christianity is a lifestyle. It must be lived every day because you are the result! Do you feel weighted down? Let Jesus lighten your load!